Prevent violent radicalization of inmates. Promote disengagement. Facilitate reintegration into society. (2) elaborate a model for an alternative way to traditional detention that includes disengagement and rehabilitation programmes for extremist detainees. - to promote disengagement behaviours in radicalised individuals in prisons. - 170 PROFESSIONALS WORKING IN THE PRISON SYSTEM (penitentiary police, social assistance operators, healthcare operators, volunteers, religious representatives, lawyers) are included in the discussion groups and training programme for prison operators (WP4) to boost their competences and skills, and to set up the alert system to detect and monitor the radicalisation process inside the prison. The programme follows the analyses of the European best practices on measures to prevent and combat violent radicalisation and mapping of prison operators’ needs (WP3). The programme is supported with two web tools: web platform with useful resources and online consultation service for prison operators, both disseminated via social networks and live events in 9 partner countries (WP2). 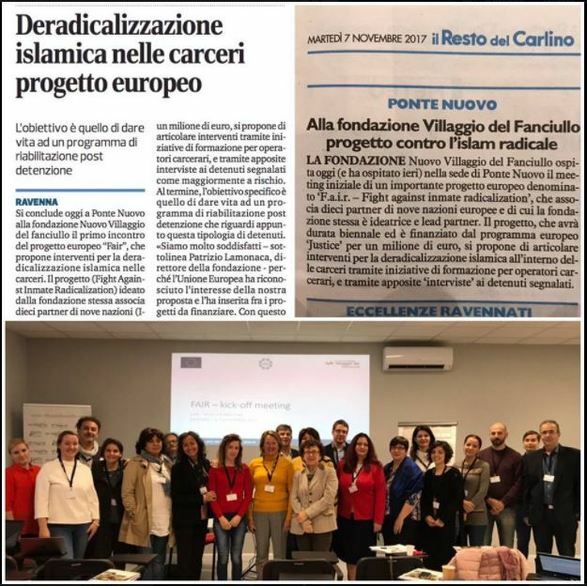 - 45 INMATES openly radicalised or vulnerable to extremist recruitment are involved into the rehabilitation programme in 9 EU prisons (FI, HU, IT, LT, MT, NL, PT, RO, SI). - 156 STAKEHOLDERS from judiciary system and institutional representatives are involved in spreading out the model of alternative detention centre for the rehabilitation of radicalised inmates (WP5) in order to reach agreements that allow for the concrete operational feasibility in prison system. *Radicalisation is defined as “the phenomenon of people embracing opinions, views and ideas which could lead to acts of terrorism”, Art.1 of the Framework decision on combating terrorism (Council of the EU, framework-decision 2002/475/JHA on combating terrorism, 13 June 2002.